George Bennett (born 7 April 1990) is a New Zealand professional road racing cyclist, who currently rides for UCI WorldTeam Team Jumbo–Visma. He represented New Zealand at the 2016 Summer Olympics. Team Jumbo–Visma is a men's professional bicycle racing team, successor of the former Rabobank. The team consists of three sections: ProTeam, Continental, and Cyclo-cross. Waimea College is a co-educational secondary school in Richmond, Tasman District, New Zealand. With a growing roll of 1500+ students from year groups 9–13, Waimea College is equipped with a park-like campus and numerous facilities. The men's road race was one of 18 cycling events of the 2016 Olympic Games in Rio de Janeiro. The race started and finished on 6 August at Fort Copacabana and was won by Greg Van Avermaet of Belgium. In 2017, he became the first New Zealander to win the general classification at a UCI World Tour cycling event, when he won the Tour of California. Bennett also entered the 2017 Tour de France, and finished 7th on Stage 9, but retired midway through stage 16 when he came down with gastroenteritis. He would return to Girona to recover. The Tour of California is an annual professional cycling stage race on the UCI World Tour and USA Cycling Professional Tour. It is the only event on the top-level World Tour in the United States. It was first held in 2006. The eight-day race covers 650–700 miles (1,045–1,126 km) through the U.S. state of California. The 2017 Tour de France was the 104th edition of the Tour de France, one of cycling's Grand Tours. The 21-stage race took place across 3,540 km (2,200 mi), commencing with an individual time trial in Düsseldorf, Germany on 1 July, and concluding with the Champs-Élysées stage in Paris on 23 July. A total of 198 riders from 22 teams entered the race. The overall general classification won by Chris Froome of Team Sky, his fourth overall victory. Rigoberto Urán (Cannondale–Drapac) and Romain Bardet finished second and third, respectively. Paul Martens is a German professional road bicycle racer, who currently rides for UCI WorldTeam Team Jumbo–Visma. He was named in the start list for the 2015 Tour de France. Eros Capecchi is an Italian professional road bicycle racer, who currently rides for UCI WorldTeam Deceuninck–Quick-Step. Kevin De Weert is a former Belgian professional road bicycle racer. In October 2014 it was announced would join Team Jumbo–Visma on a two-year deal from 2015, with the team's directeur sportif Nico Verhoeven describing his role as a domestique for the team's general classification riders in stage races. De Weert retired on his 33rd birthday due to the continuing effects of injuries sustained earlier in his career. In February 2016 he succeeded Carlo Bomans as coach of the Belgian national cycling team. Hans Jacob "Jack" Bauer is a New Zealand professional road racing cyclist, who currently rides for UCI WorldTeam Mitchelton–Scott. Bauer turned professional in 2010. Kristijan Koren is a Slovenian professional road racing cyclist, who currently rides for UCI WorldTeam Bahrain–Merida. Koren turned professional in 2010. Bert-Jan Lindeman is a Dutch professional road bicycle racer, who currently rides for UCI WorldTeam Team Jumbo–Visma. His older brother Adrie is also a cyclist, who last rode for the Koga team in the Netherlands. Joseph Lloyd "Joe" Dombrowski is an American professional road racing cyclist, who currently rides for UCI WorldTeam EF Education First Pro Cycling. A professional since 2011, Dombrowski has also competed for Bontrager–Livestrong and Team Sky. Danny van Poppel is a Dutch professional road racing cyclist, who currently rides for UCI WorldTeam Team Jumbo–Visma. Primož Roglič is a Slovenian racing cyclist, who currently rides for UCI WorldTeam Team Jumbo–Visma. Roglič started his career as a ski jumper but then shifted to cycling. Davide Formolo is an Italian professional road racing cyclist, who currently rides for UCI WorldTeam Bora–Hansgrohe. Formolo turned professional in 2014. Davide Villella is an Italian professional road racing cyclist, who currently rides for UCI WorldTeam Astana. Villella turned professional in 2014. Alberto Bettiol is an Italian professional road racing cyclist, who currently rides for UCI WorldTeam EF Education First Pro Cycling. Bettiol turned professional in 2014. Lennard Hofstede is a Dutch racing cyclist, who currently rides for UCI WorldTeam Team Jumbo–Visma. He rode at the 2014 UCI Road World Championships. He was named in the startlist for the 2017 Vuelta a España. In May 2018, he was named in the startlist for the 2018 Giro d'Italia. Dylan Groenewegen is a Dutch professional road racing cyclist, who currently rides for UCI WorldTeam Team Jumbo–Visma. Floris De Tier is a Belgian professional racing cyclist, who currently rides for UCI WorldTeam Team Jumbo–Visma. He was named in the startlist for the 2017 Vuelta a España. Patrick "Paddy" Bevin is a New Zealand professional road racing cyclist, who currently rides for UCI WorldTeam CCC Team. Laurens De Plus is a Belgian cyclist, who currently rides for UCI WorldTeam Team Jumbo–Visma. He was named in the start list for the 2017 Giro d'Italia. Koen Bouwman is a Dutch cyclist, who currently rides for UCI WorldTeam Team Jumbo–Visma. He was named in the startlist for the 2016 Vuelta a España. In May 2018, he was named in the startlist for the 2018 Giro d'Italia. Neilson Powless is an American cyclist, who currently rides for UCI WorldTeam Team Jumbo–Visma. ↑ "Bennett to link up with RadioShack-Nissan-Trek". Cyclingnews.com . Future plc. 11 November 2011. Retrieved 20 November 2013. ↑ "Cheery Christmas for ambitious Team Jumbo-Visma". 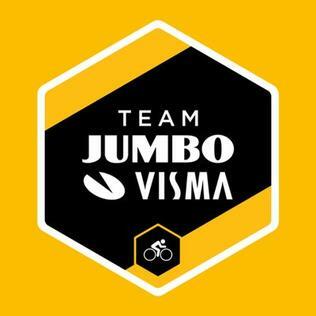 Team Jumbo–Visma . Team Oranje Road BV. 21 December 2018. Retrieved 4 January 2019. 1 2 Long, David (12 July 2016). "Kiwi rider George Bennett has bike checked for motor at Tour de France". Stuff.co.nz . Retrieved 6 August 2016. ↑ "George Bennett guest column: a stitch in time". Rouleur . 1 October 2018. Retrieved 3 October 2018. ↑ "Kittel, Voigt and Velits set for Santos Tour Down Under". Cycling Central. Special Broadcasting Service. 8 January 2013. Archived from the original on 10 January 2013. Retrieved 10 January 2013. ↑ "George Bennett joins Belkin". sbs.com.au . 10 October 2014. Retrieved 18 October 2014. ↑ Rollo, Phillip (31 July 2016). "Riding to Rio – George Bennett backs up from solid Tour de France debut". Stuff.co.nz . Retrieved 6 August 2016. ↑ Gilhooly, Daniel (7 August 2016). "Gamble doesn't pay for shattered George Bennett". Stuff.co.nz . Retrieved 7 August 2016. ↑ "George Bennett becomes first Kiwi to win World Tour cycling event at Tour of California". Stuff.co.nz . 21 May 2017. Retrieved 21 May 2017. ↑ "Tour de France 2017: George Bennett forced to pull out due to illness". Newshub. 19 July 2017. Retrieved 19 July 2017.